The Jacksonville History Show: Jacksonville Historical Society President Ed Booth Jr. discusses downtown’s Endangered Buildings successes and future prospects. With Harry Reagan. The Jacksonville History Show: Executive Director Emily Rutherford Lisska and JHS Archivist Taryn Rodriguez-Boette discuss the many “treasures” of the Jacksonville Historical Society. Edward M. Kellogg album includes photos of imprisoned Apaches at Castillo San Marcos. The Jacksonville Historical Society is soliciting gingerbread house builders for the event. Ms. Lisska hopes for a possible Hemming Park gingerbread construction to front the St. James building, the former Cohen Bros. Dept. Store, and now City Hall. The Gingerbread House Extravaganza is endowed through the Delores Barr Weaver 2015 $10,000 Event Fund Grant. The $4 million fund supports fundraising efforts for 20 local non-profits and is administered through the Community Foundation for Northeast Florida. 88% Skills test Multimedia Storytelling — Accolades for jump-cut avoidance! Mayport, Fla. — On the day after Thanksgiving, the river was calm and the sky a clear blue as Capt. 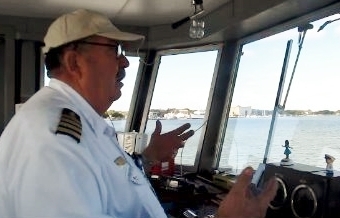 Wayne Fenner piloted the St. Johns River Ferry between Mayport village and Ft. George Island. After seventeen years this would be his last Thanksgiving weekend carrying cars and pedestrians between the two landings. Traffic had been heavy Thanksgiving day and still was the next with travelers headed to or from Amelia Island and Georgia. Fenner said most pedestrians had been to dinner at the landmark Sand Dollar Restaurant on the north shore. A fire badly damaged the restaurant in March 2012. Fenner remembered the thick, black smoke billowing into the sky across the river as he arrived at the ferry dock in Mayport to start his shift. It took 40 firefighters, including a marine unit, about five hours to contain the blaze. The St. Johns River Ferry is better known as the Mayport Ferry and Jean Ribault is the name of the boat. Fenner was hired on as a part-time relief ferry captain with the Florida Dept. of Transportation back in 1995. Fenner will retire in June and from the pilot house he had a story or two to tell. In September 1999, the monster storm Hurricane Floyd was forecast to strike Florida triggering the evacuation of more than one million coastal Floridians. Fenner was part of the evacuation team for residents leaving the Jacksonville Beaches area through Mayport. In this video, Fenner tells his hurricane story while crossing the river from Mayport to Ft. George Island. Watch for wake turbulence – the Sand Dollar Restaurant begins to pass by from the west and is recognizable by its oversized outdoor porch roof. The Mayport Ferry had been under the purview of FDOT since 1948, but ran into turbulence of its own when the state stopped its funding in the 2007 – 2008 lean fiscal budget year. The Dames Point Bridge was to be the alternate route to S.R. A1A, which the ferry connects, a distance of some 28 miles west. Influential businesses and residents using the ferry daily convinced the city to maintain the ferry. By 2011 JAXPORT could no longer afford to maintain the ferry at the expense of it core cargo business. A grassroots organization called “Save the Ferry” rallied to keep the ferry in operation. In February 2012 JAXPORT announced it would run the ferry through Sept. 30, much to Mayor Alvin Brown’s relief. 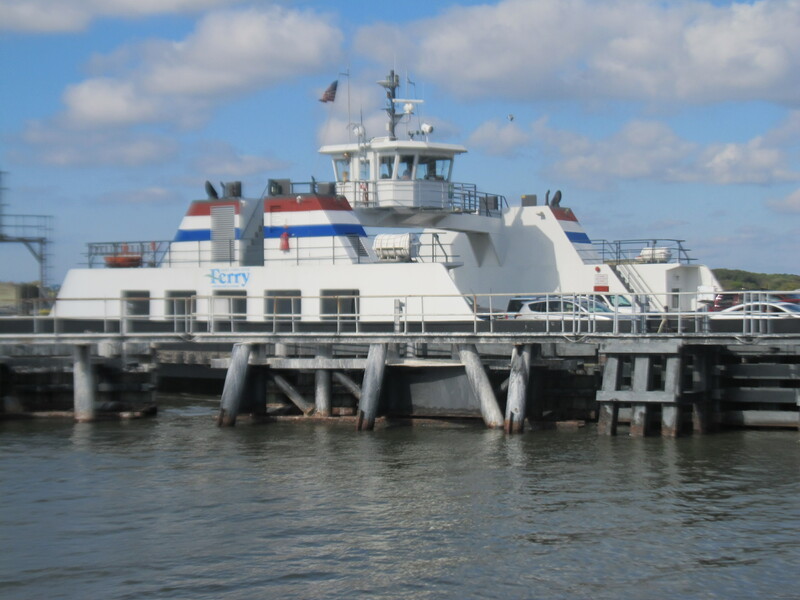 The city set up a public-private partnership for the ferry and is currently in negotiations to transfer ownership of the St. Johns River Ferry to Jacksonville Transportation Authority. Hornblower Marine Services has managed the ferry for whoever happened to own it for the past 18 years. HMS Mayport General Manager Mark Fernandez said negotiations with JTA should be completed by the end of next year’s first quarter. Back on the Jean Ribault a few days after Thanksgiving, there was a slight delay in departure as a blanket of fog rolled in from the Atlantic. A Wallenius carrier appeared from the west almost as a ghost ship sailing out to sea. It crossed paths with another auto carrier bound for Blount Island. “The bigger the ship, the deeper the horn,” said Fenner. He recalled fondly the bonds the Mayport community has with the ferry. Fenner used to give birthday cards to the family of kids who grew up riding the ferry back and forth to school. He laughed because one time a regular commuter won the drawing for a year’s free ridership at Ferry Fest, a fund-raising event held annually by the “Save the Ferry” group. He thought they never did hold that drawing again. As the ferry pulled into Ft. George, Fenner pointed to the dock hold and said sometimes they get alligators, and snakes, and otters in there. Richard Plourde, an old-time engineer who had been in the pilot house the whole time and hadn’t said much, motioned back toward Mayport. “One time we got a whale,” he whispered hoarsely. It is a tradition for regular commuters to bring Thanksgiving dinner to the crew of the Jean Ribault. Next year, Capt. Wayne Fenner will be at his other home for Thanksgiving dinner. 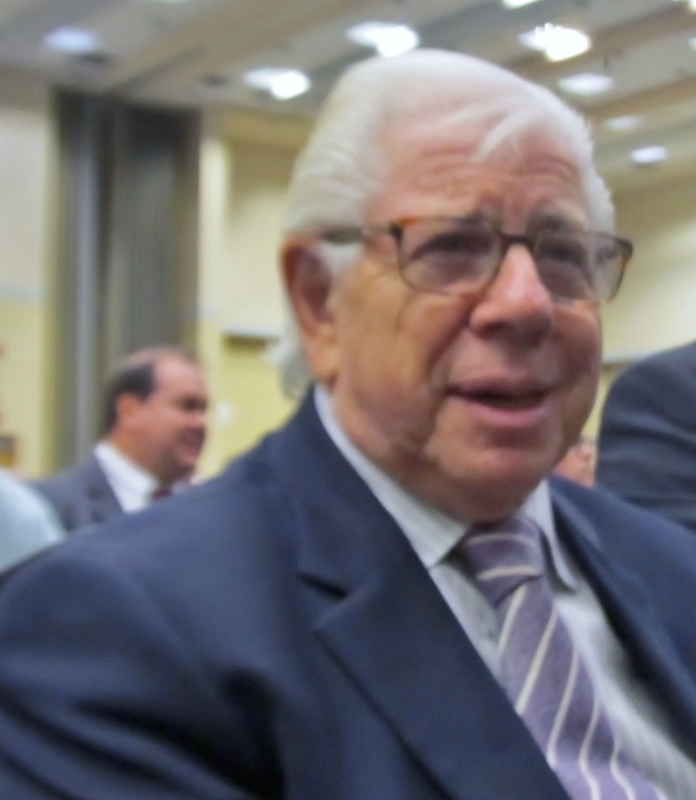 Jacksonville, Fla. — Legendary journalist Carl Bernstein told an audience of about 700 on Thursday at the University of North Florida that is possible to have a government whose most basic function can work. He said the Washington, D.C. of today practices the politics of ideology and demagoguery and is unable to solve problems for the good of the country. He blames most of the media for creating manufactured controversies, and many voters for how they process and receive politically-biased news and information. In his Oct. 28 eulogy to his former Washington Post editor, Ben Bradlee, at the National Cathedral in Washington, D.C., Bernstein said what characterized Bradlee was that he wasn’t afraid of the news, of presidents, or of political correctness. “Ben Bradlee … was willing to make mistakes because he believed in this idea of obtaining the best available version of the truth,” said Bernstein. Bradlee oversaw publication of Bernstein and Bob Woodward’s investigation into illegal activities by the Nixon administration which eventually toppled his presidency. To reinforce his earlier point that a majority of media no longer sees Bradlee’s truth, Bernstein turned to Les Gelb, who left the New York Times in 1993 to join the Clinton Administration. Bernstein recited excerpts of Gelb’s last column. Bernstein pivoted to the the government shutdown of 2013. He said it was unheard of that leaders of one political party should endanger the full faith and credit of the U.S. for partisan ideological reasons. Bernstein said nothing like the opposition to the president’s healthcare plan from the Republican “Tea Party” wing had happened since the McCarthy era. President Obama, on the other hand, has not taken steps to break gridlock in Washington as he pledged to do while running for office, and has missed opportunities to move the agenda forward. Today, Bernstein said, Washington can’t frame the debate nor agree on a starting place. He brought the audience through Watergate, from his Washington Post story beginning “John Mitchell, while attorney general, controlled a secret fund” to the Senate Watergate hearings where slowly much of the Nixon criminality became known. Nixon wouldn’t give up the tapes. The case went to the Supreme Court. The congress began impeachment proceedings. “The judicial committee passed articles of impeachment because members of the president’s own party said truth is more important than partisanship,” Bernstein said. That is how the system should work. The last election cycle showed the country senses the basic function of government does not work, but Bernstein is not optimistic that partisanship will disappear by the next election. He looks to this country’s great entrepreneurial spirit and the next generation to rebuild a system that can work. 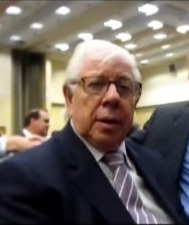 A bemused Carl Bernstein before his UNF lecture on Nov. 6. 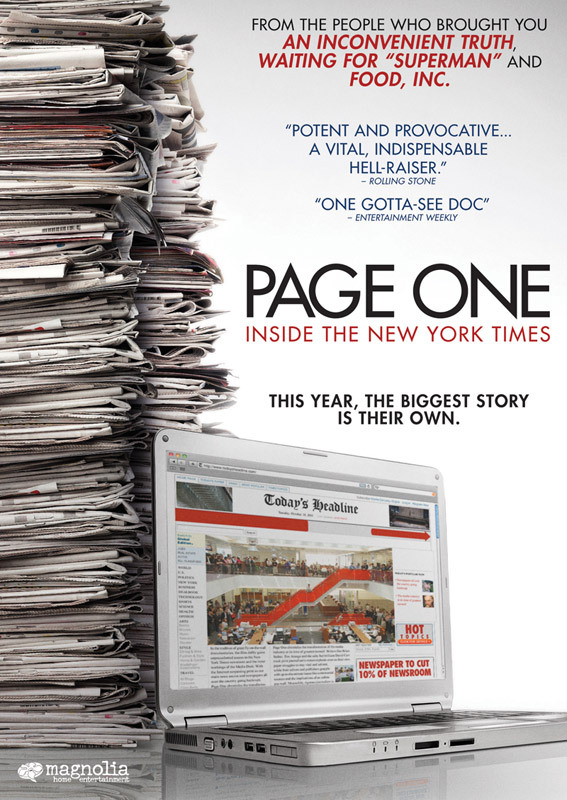 The documentary “Page One: Inside the New York Times” by Andrew Rossi chronicles a year at the newspaper from behind the Media desk. The year is 2010, just after the collapse of the newspaper print advertising market. Newspapers across the country are beginning to fold. The NYT is in the process of laying-off 100 people. Jeff Jarvis (Author, What Would Google Do?) and Katrina vanden Heuvel of The Nation set the stage. Jarvis declares firmly the old newspaper model is dead but news is not dying, there are just many cheaper ways of disseminating it. Vanden Heuvel worries that it is a dangerous moment for journalism, but newsrooms have the benefit of journalists with accumulated experience. Jarvis asks if it’s too late for these institutions to adapt to new media. Brian Stetler is a techno-savvy NYT Media reporter. He started a blog covering television news in 2004 as a freshman in college. He went to work for the NYT two months after he graduated. David Carr is an old-school Media reporter with a weekly column. Carr jokingly calls Stetler a “machine” put on this earth to destroy him. Stetler represents the NYT’s adaptation to the digital age. It is a remarkable coincidence that Rossi happened to be filming Stetler and Media editor Bruce Headlam as the story of the initial WikiLeak’s YouTube release of classified Dept. of Defense (Afghan theater) video develops. It is almost unbelievable that Rossi had access to Stetler as he was interviewing his source, WikiLeaks founder, Julian Assange. The NYT made a bold decision in allowing Rossi such unprecedented access to its inner workings at a time when new and successful media business models were emerging at a rapid pace. Perhaps the collaboration between Rossi and the Media dept. allowed the NYT to view the media industry as a whole in a more objective light. It is through Carr that we see the NYT embracing new technology. To him, Steve Jobs invented the iPad solely to keep “mainstream media” afloat. We see Carr as a passionate advocate for the strength of NYT news-gathering assets and its full engagement in the multi-media revolution. Without main-stream media, news-repackagers like Gawker, or news-aggregators like Newser, couldn’t exist. Tribune Company was sold to billionaire Sam Zell. Within a year, 4,200 employees lost their jobs and the company went into bankruptcy. Zell’s management team had little newspaper experience. The new Tribune corporate chief, Randy Michaels, hired 20 former radio associates. They rewrote the company handbook, basically condoning sexual harassment. The innovative approach that Zell had promised would breathe life into the staid Tribune Company was not investment in innovative news technologies, but advertising gimmicks. The Tribune Company’s already dwindling audiences were offended. The bankruptcy restructuring was unresolved while Carr was investigating the story. As to what the Tribune’s media story tells us about the threat to the newspaper industry, I would posit that in 2014 the first and foremost duty of print and on-line media is …another closing graf in progress! FEEDBACK: Carr’s story forced resignations would be a good closing graph. Jacksonville, Fla. — Robert E. Walkord’s first job was unloading trucks full-time at night while he attended Arkansas Tech full-time during the the day. That was in the 1960s. He was paid $ .85 per hour. Walkord graduated with a mathematics degree and started his business “from scratch” about 40 years ago. 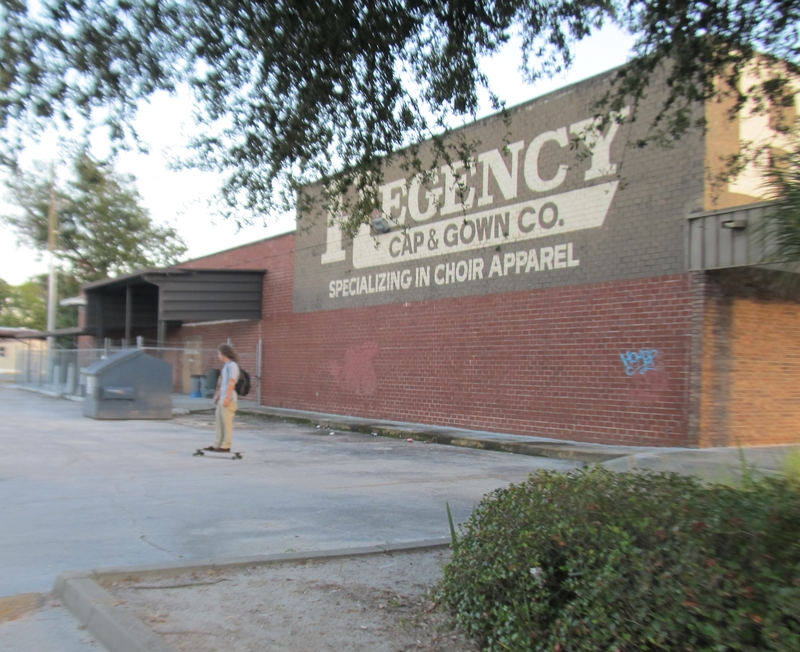 Walkord owns Regency Cap & Gown Co., a domestic manufacturer of pastor and choir apparel for church and school. His factory and showroom anchors what used to be a shopping plaza on the corner of Atlantic Blvd. and Arlington Rd. Walkord used to employ 155 people. He said he downsized his business in 2011 because Aetna Insurance cancelled his employee benefits policy after he failed to comply with one of the regulations imposed by the 2010 Affordable Care Act. But refighting the Obamacare battle is not a political issue in the 2014 Florida gubernatorial race between challenger and former Gov. Charlie Crist (D) and incumbent Gov. Rick Scott (R). Crist favors raising Florida’s minimum wage to $10.10 per hour, mirroring President Obama’s numeric goal for the nation. Florida’s current minimum wage is $7.93 per hour, above the federal level of $7.25 per hour. Scott said during the campaign that he supports the idea of a minimum wage but the private sector sets the rate. Moderator Jake Tapper asked Scott if he supports the concept of the government setting a minimum wage during the Oct. 21 gubernatorial debate hosted in Jacksonville. 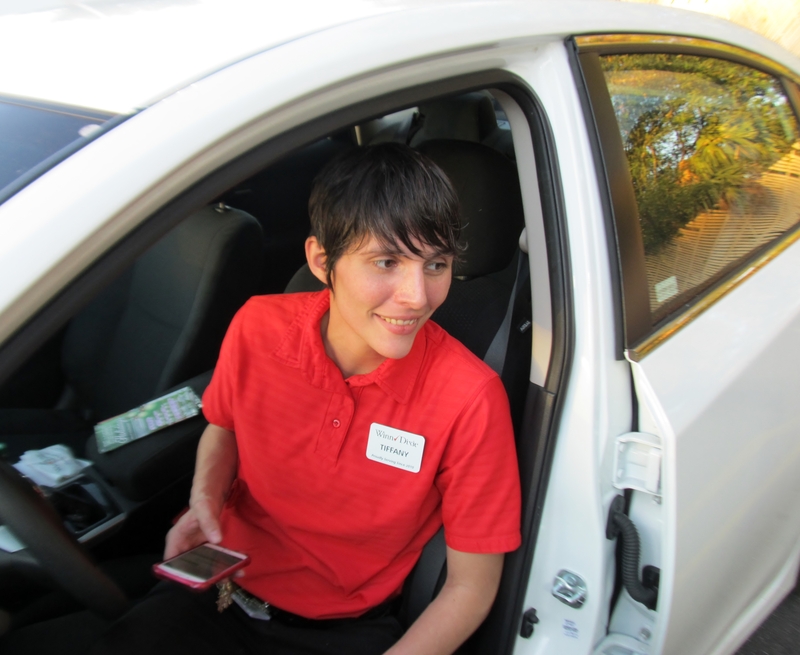 Tiffany Kaminsky works part-time at Winn-Dixie and leaving for the day. “Sure. But the truth — but the bottom line is just because they set a minimum wage doesn’t mean you get a job,” said Scott, according to a Miami Herald transcript of the debate. When Regency Cap & Gown Co. employed 155 people, Walkord said he had minimum-wage workers. Now that he has 45 employees, all earn over the minimum wage. Walkord is 73 years old. He supports the livelihood of employees who have worked for him most of their lives. They are salaried and a select few work by piece-meal: paid per garment completed. Walkord’s downsizing of his company could be considered an extreme example of the private market setting a minimum wage, but he does have an opinion of Gov. Crist raising Florida’s minimum wage. “If you start someone at $10.10 an hour there’s no incentive to do better,” he said. Across the parking lot from Regency Cap & Gown Co. is one of Winn-Dixie’s 485 grocery chain supermarkets. Winn-Dixie has been in operation under its present name since 1955. The corporation declared Chapter 11 bankruptcy in 2005 and was acquired in 2011 by Bi-Lo, another Southeastern grocery store chain. Bi-Lo Holdings is based in Jacksonville. Raising the Minimum Wage: "I love it" Kaminsky said "It's better in the long run for everyone as long as the price of living doesn't go up." Tiffany Kaminsky just ended her part-time shift on early Tuesday evening, She is in her late 20s and attends Florida State College at Jacksonville. Kaminsky has worked on and off at Winn-Dixie in different capacities for 10 years; seven of those full-time with benefits. She is now a senior cashier and earns $10.60 per hour. Baggers at Winn-Dixie earn minimum wage. When asked the hypothetical question of one bagger losing his or her job because the minimum wage was raised to $10.10 per hour, a spark lighted in Kaminsky’s eyes. In her opinion, the loss of one job to the benefit of others is a good idea. Dana Carswell lives in Arlington. After work on Wednesday evening she voted early at Regency Square Library. She does not feel $10.10 per hour is an unreasonable amount to pay employees and businesses should prepare for that. She said there is too much poverty in this country and too many people rely on the government to make ends meet. This year’s feature Fall exhibit at MOCA, “Get Real: New American Painting,” focuses on eight contemporary realist painters with “extraordinarily recent” work, from the year 2000 to now. 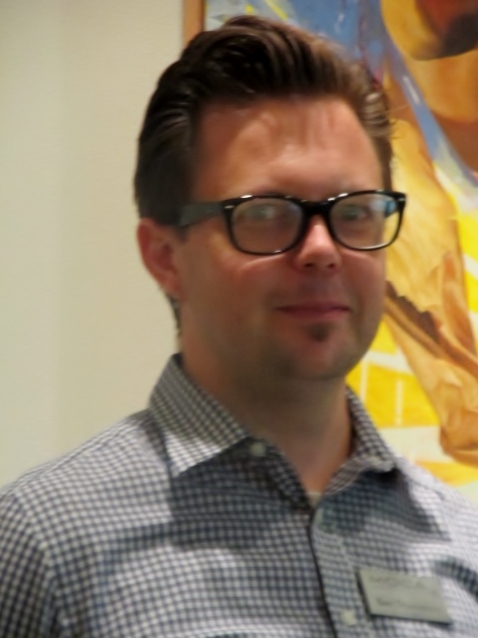 Ben Thompson, Curator at Museum of Contemporary Art Jacksonville, conceptualized and executed this exhibition, as he does for MOCA Jacksonville throughout the year. Thompson selected a group of emerging young painters, mostly under 40 years old, from across the country. He then arranged for the loan of selected pieces from museums and galleries to MOCA Jacksonville for the duration of the show: Sept.13 – Jan. 4, 2015. The eight painters are: Haley Hasler, Jason John, Andrea Kowch, Bryan LeBoeuf, Jenny Morgan, Kevin Muente, Frank Oriti and Kevin Peterson. The common theme uniting the artwork is realist portraiture in urban, pastoral and heartland landscapes. 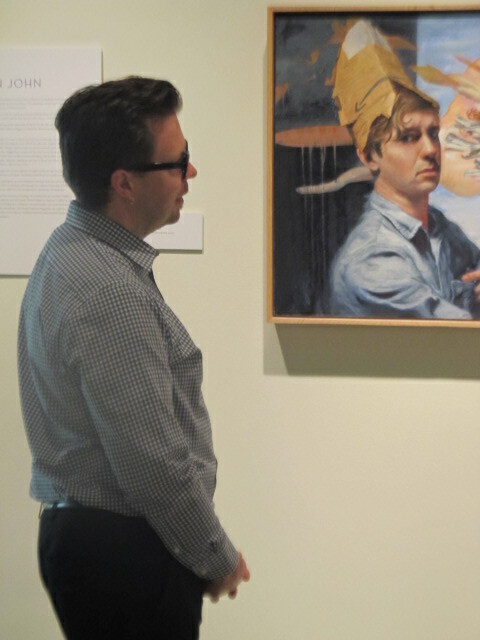 Thompson said MOCA is fortunate, in this instance, that one of the artists is Jason John, a UNF professor in Art and Design. A MOCA studio was created for him adjacent to the exhibit. John’s work adds a surrealist dimension; his figures have a dreamlike association with their environment. MOCA Jacksonville is a cultural resource of University of North Florida. Thompson asked Art History Professor Scott Brown to write an essay contextualizing the artwork for the publication which would accompany the show. They had served together on several committees and Thompson knew that although Brown was a medievalist, he had an interest in the cutting edge art of today. Brown found that many of the artists alluded to the past in their subject matter, composition, or technique. 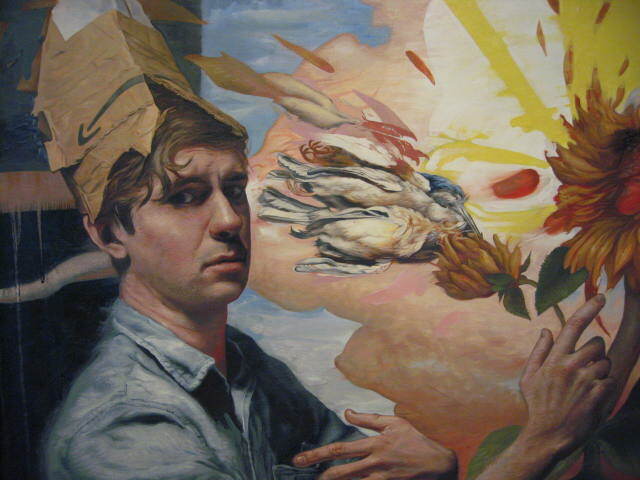 Jason John’s “Birdboy” pays homage to Flemish Baroque artist Anthony Van Dyck’s “Self-portrait with a Sunflower” (1632). Because these are young artists, there has not been the availability or opportunity for art historians to look at their work in depth. Brown proposed and developed a Junior Methods Seminar where his students will spend the semester examining the nature of the exhibit as a whole. They will research one artist and then write a scholarly essay on one piece of that artist’s work. 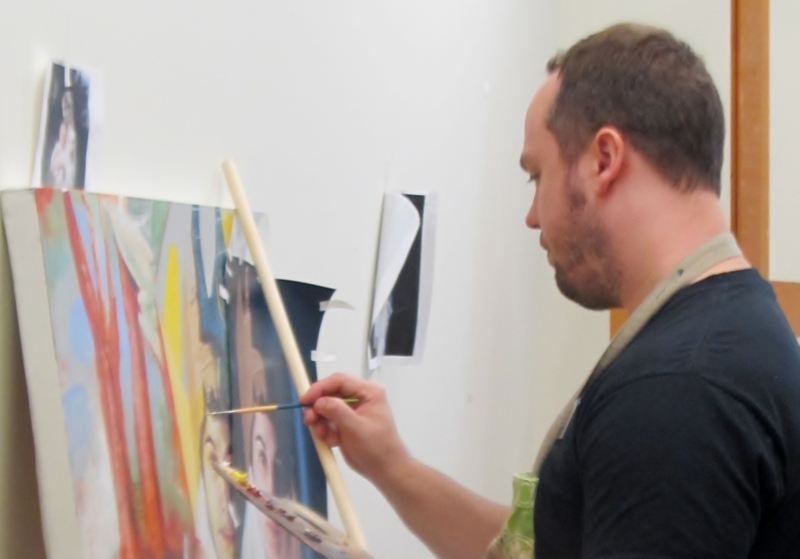 Over the course of the exhibit, John will be creating a body of artwork from the MOCA studio two days a week. The public can observe and experience the process; sometimes he might be sketching, or painting, or talking on the phone with an art dealer in Chicago, or talking with a MOCA visitor. In this audio slideshow, Thompson gives an overview of the “Get Real: New American Painting” exhibit and then introduces Jason John’s MOCA Jacksonville art studio. John then discusses his experiences with visitors and what they learn from each other. NOTE: Technical difficulties with slideshow photographs. Rework in progress with captions. Please see photo page for larger photos. Some show painting detail only.